Show and Tell Meg: Request Your New P&G Brand Sampler! 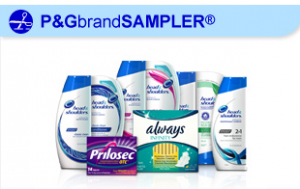 Request Your New P&G Brand Sampler! It's that time again :) Sign into your P&G Brand Sampler account to see if you have any new sample offers available. I got a sample of Head and Shoulders, Always, and Prilosec OTC (you have to see if you qualify for the Prilosec).